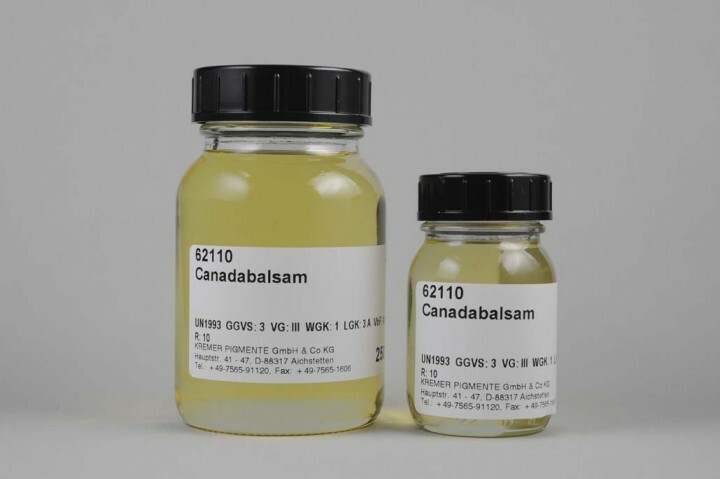 Canada Balsam | Balsams & Wax | Solvent-soluble Binders | Mediums, Binders & Glues | Kremer Pigments Inc.
P241: Use explosion-proof electrical/ventilating/lighting equipment. P370+P378: In case of fire: Use sand, dry extinguishing powder or foam for extinction. P403+P235: Store in a well ventilated place. Keep cool. Canada Balsam is obtained from Canada balsam fir Abies candiensis. Highly viscous, it is unique in its transparency, pale yellow color, and high refractive index. Chemical description Mixture of oleoresin acid and ethereal oils. Customer evaluation for "Canada Balsam"